On April 21, 2019, Quest Plus Conference Center, Clark brings an exciting Easter Sunday celebration for kids and kids-at-heart. 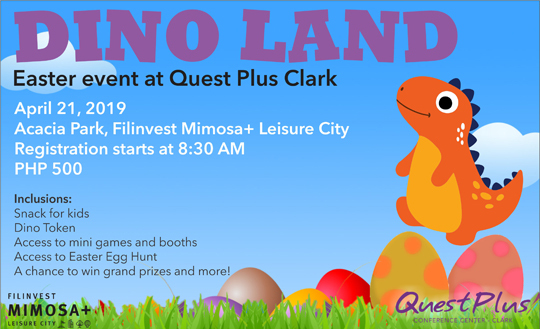 Roam around with friendly dinosaurs as you hunt for Easter eggs filled with sweet treats and search for the rare golden eggs to get a chance to win grand prize, an overnight stay in Quest Plus Clark’s Villa Deluxe! Plus, the best Dino-themed Easter basket gets a chance to win an overnight stay in a Club Deluxe Room with buffet breakfast for two at Mequeni Live. Have a fun-filled family day with games and activities like mini-golf, Easter egg painting, and even an opportunity to ride the horse-drawn carriage around the verdant Filinvest Mimosa+ estate. Snacks and loot bags filled with sweet treats are also ready for the participating kids. For just PHP 500 per head, kids will get to enjoy all these and more. For adults, entry pass is PHP 100. Tickets are sold at the hotel lobby and at the registration booth during the event. Registration starts at 8:30 AM at Acacia Park, the perfect outdoor venue for every celebration. Developed by Filinvest, Acacia Park offers a sprawling natural landscape great for birthdays, receptions, and company events. Supplier, Leslie's Corporation, The Medical City, Liwayway Marketing Corporation (Oishi), Homsprinters, Rab4Love Studios, Pascual Creamy Delights, RNCJ Design & Print, El Kabayo, and SBL. At Quest Plus Clark, you can rely on us for a colorful Easter Sunday. For reservations, please call (045) 599 8000 or send a message through the official Facebook page, Quest Plus Conference Center, Clark.